Experience Toronto's vibrant harbourfront and stunning views of Toronto's beautiful skyline. 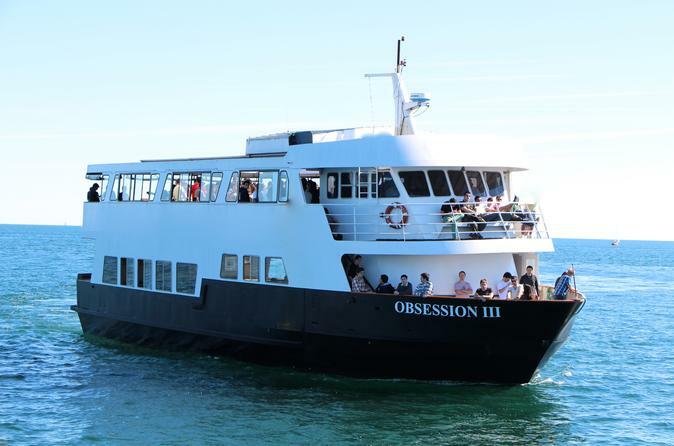 If you're looking for delicious food and fabulous entertainment, the Obsession III Dinner Cruise is perfect for you. Enjoy an elegant 4-course dinner, prepared by on board chefs and only using the freshest local ingredients. Have a cocktail or local beer from our full licensed bar and take in the open waters of Lake Ontario. Departing from the central waterfront, Obsession III offers spectacular dinner cruises to fit any occasion. This is the perfect cruise to enjoy the breath-taking views of Toronto's skyline, Toronto Islands and Lake Ontario - whether you’re new in town or a native Torontonian, celebrating a first date, birthday, anniversary or a night out with friends. Enjoy a contemporary 4-course dinner and be sure to save room for dessert! After dinner, the on-board DJ will be playing a mix of top 40, classic and current hits on the dance floor, where you can groove the night away. Your package includes a 3-hour cruise plus half-hour boarding, fully licensed bar for purchase on board, and a full wait staff to ensure the highest quality of service is delivered to all guests.